Abby immediately joined the long line of Catholic teenagers who were waiting their turn to make one of the capes for a child who is a patient at Peyton Manning Children’s Hospital in Indianapolis. “I think it’s great that the kids get these capes to show them that they’re superheroes,” said Abby, who traveled from the Archdiocese of Kansas City to attend the National Catholic Youth Conference (NCYC) in Indianapolis on Nov. 21-23. For three days, that combination of service and compassion resonated throughout the conference’s theme park inside the Indiana Convention Center. Each area of the theme park seemed to offer an opportunity for the conference’s 23,000 participants to make a difference, from donating “Jeans for Jesus” to cutting off 10 inches of hair for the “Locks of Love” program—a program that provides wigs for financially disadvantaged children who have lost their hair because of a medical condition. 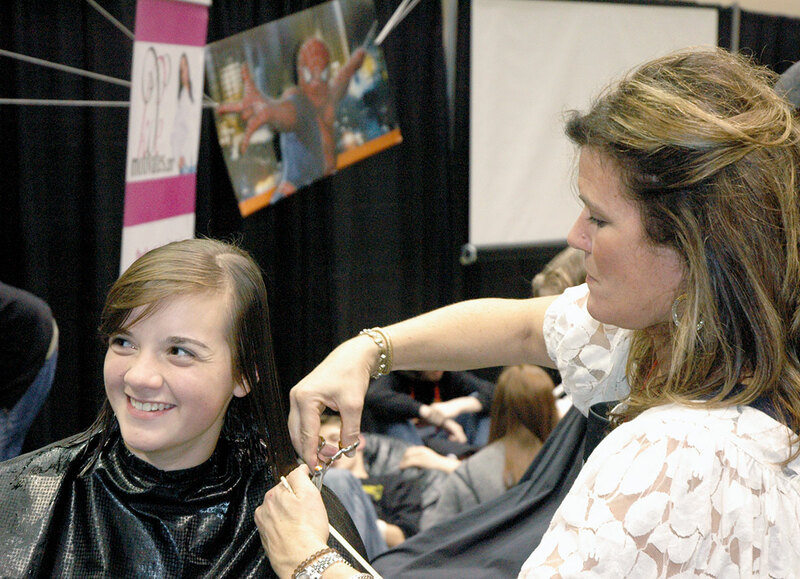 Paige Hicks was one of the 40 youths who signed up to have her hair cut during the conference. Paige said she made the decision to cut her hair after talking about it with her mother. Living out the halos they wore, 16-year-olds Christian Urmanski and Jennie Britton were part of a large contingent from the Archdiocese of Los Angeles who swooped into action to help fill, seal and pack bags of rice. Their efforts were part of a Catholic Relief Services and Helping Hands organization project determined to stop hunger in Burkina Faso, an African country hit hard by drought in recent years. Christian and Jennie both learned that each bag of rice would create six meals for someone in need. They later learned that they were among the 1,000 volunteers during the conference who assembled more than 101,000 meals to help people in the African country. For Jennie, being involved in the “Stop Hunger Now” program is an extension of the service work that has marked her life as a young Catholic—part of a generation that has embraced the concept of serving others.